Sanabul are one of the best MMA sports companies to come out with the explosion of the sport. Similar to the company RDX, Sanabul produce quality gear at low, low prices. And just like RDX, they looks just as good as it performs. It’s incredible how they manage to sell their products so cheaply whilst still maintaining a high level. You can look at a Sanabul glove or a Sanabul gi and without looking at the price tag, you’d assume it’s premium priced gear. Sanabul’s gear does not look budget at all. It looks like top of the range stuff and you’ll be happy to know that it performs like it too. Sanabul are a company that allow you to have your cake and eat it. There isn’t a BJJ/MMA product that Sanabul don’t sell. Whatever you want and whatever you need to really take your training to the next level, Sanabul can sort you out. A lot of their stuff has similar styling and motifs, which means you can completely deck yourself out in matching Sanabul gear and have them cater to your ever training need totally. 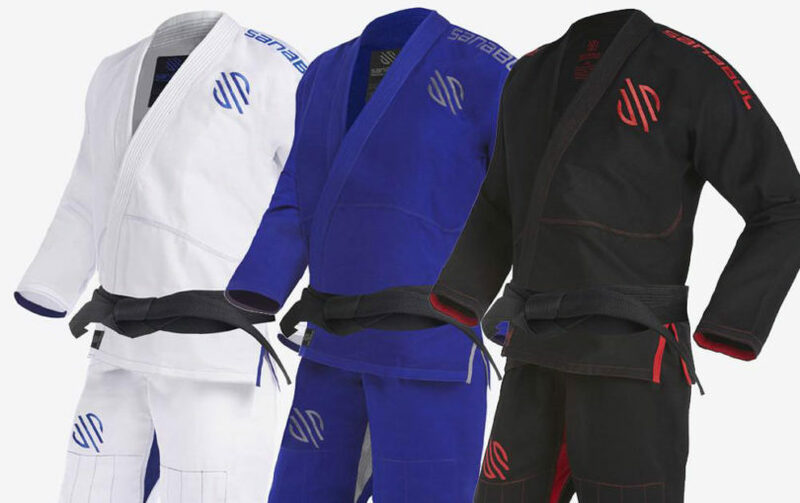 Sanabul offer several BJJ gi’s, each of them excellent quality and each of them satisfying their own particular niche, such as beginner gi’s, competition gi’s, kids gi’s, etc. As I said above, there isn’t a single need that Sanabul hasn’t endeavoured to satisfy. Despite the absolutely massive amounts of BJJ and MMA products available too, there are still some niches that haven’t been truly satisfied just yet. A big one being quality kids gear. MMA and BJJ tend to go hand in hand and MMA is a growing yet violent sport. Some companies aren’t willing to offer great kids products because they’re fairly short-sighted and don’t see the incredible demand that’s already there for kids MMA and BJJ gear that is actually any good. Sanabul are not short-sighted. They can see that kids are the future and that kids today want to train MMA, they want to train BJJ but they’re being utterly let down with the stuff that’s available to them. This kids gi from Sanabul looks incredible. It doesn’t look anything like a kids gi. From the images alone it could quite easily be an adults gi. There’s no silly kids-style styling. Kids want to feel grown up and they want the real deal, not a watered-down version. Again, Sanabul are wise enough to give it to them. The gi’s have been made of material that mitigates the shrinkage as much as possible. This means the gi won’t shrink as much as adult sized gi, which means that the gi will last the child that much longer as they won’t be outgrowing it as fast. Though if you do wish to, the gi can be shrunk by hot water washes and even put in the dryer without any adverse effects. Sanabul make the claim that they are the only company offering ultra-light gi’s that are already pre-shrunk. If you’ve been training for a while and you already own or have owned a variety of gi’s then you know how annoying the gi shrinkage can be. It’s extremely hard to shrink them just right and you can often end up with a gi that’s warped or shrunk too much or having to just deal with a gi that’s too big because you don’t want to risk shrinking it. Having to rely on colder washes that sometimes don’t fully clean the gi. Pre-shrunk ultra-light gi’s, like this excellent one from Sanabul are an excellent addition to your gym bag so you can have that ultra-light gi you want but without all the messing about with sizes and shrinking. Though it can be shrunk with hotter washes and tumble drying if you wish to. If you do shrink it, you’ll be happy to find that it shrinks in proportion unlike some inferior gi’s that completely lose their shape and integrity. Most people use the same gi regularly. They may have a wardrobe full of gi’s but they often have a favourite that receives multiple uses a weak and is almost constantly in the wash or drying. You may have noticed that after a ton of washes, some gi’s just don’t quite wash up as well as they used to. They can sometimes gain a body odour smell or a damp, mildew smell even though you’ve washed it two or three times. If you’ve had this problem before, you’ll be happy to know that Sanabul have used anti-microbial and anti-door treatments which help to prevent this issue as well as preventing the spread of bacterial and fungal infections. When buying a gi, you’re always making a trade-off. It’s impossible for one gi to satisfy everyones needs and wants. Everyone is unique and individual and has their own exact requirements, meaning that you often have to weigh the pros and cons when choosing a new gi to buy. The most common trade-off and compromise you have to make is between the weight and durability. Generally speaking, the thicker and heavier the material, the stronger the gi is going to be. It doesn’t necessarily mean that the ultra-light gi’s are weak or inferior, but the heavier, double-weaves are just going to be sturdier. It’s simple science. Sanabul don’t like that people have to make this compromise. They believe that with their knowledge and experience, you can have both. No need to settle or compromise at all. With this, their Highlights Professional Competition gi, Sanabul have created a gi that is as thin and light as can be whilst being stronger than almost any other single weave gi on the low-price market. Sanabul have given you durability and lightness and they’re changing barely anything for it. They offer this excellent gi in white, blue and black and a wide variety of different sizes. Each colour and size is also 100% IBJJF approved and ready for competition.